Older marlin glennfield 60 for sale. Its not the cleanest gun in the world but functions well. Great inexpensive gun for the truck or tractor. JM stamped. Newer feedthroat has been installed and shot 100 rounds with no issues yesterday. Pretty accurate. Was ringing a 4 inch steel plate at 50 yards and was hitting it on probably 90% of my shots. $125 in Wake County. Only trade would be for a ruger 10/22 with some cash on my end to make up any price difference. Very minor near end of barrel. A little oil may get rid of it. Does it come with the pelican for $125????? No. Doesnt come with whats inside the pelican either. Nice looking rifle. I just got on like that at a pawn shop, put a new feed throat kit in it and it shoots great now. I was looking one with the squirrel stock like you have. I like those old Marlins though. What are the first 2 numbers on your serial number. Mine are 26 which makes it a 1974 model. This one is a 24XXXXX. Guess that means '72? What part of wake county? I'll do anywhere in wake cause thats what the ad says. Outside of that I can do most of johnston and franklin counties. SPF. Will delete after transaction. Message me if deal doesnt work out. 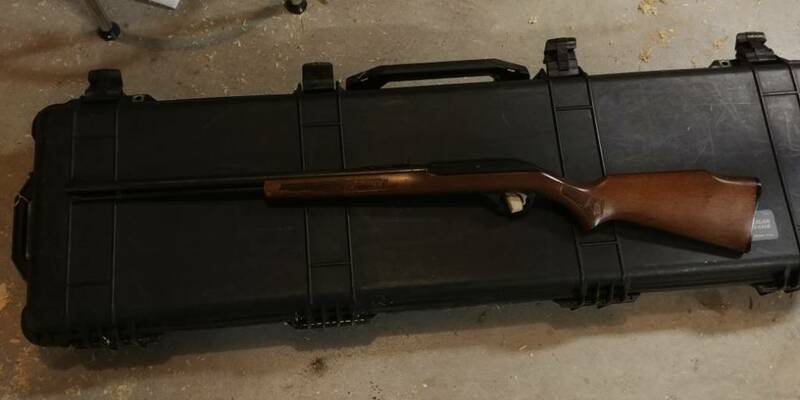 I have a 10/22 I may be interested in trading. Always liked the older Marlins. Im located about 5 miles from knightdale.